What are you basing your evangelism on?—feeling, emotion…or Truth? Critical thinking skills are essential to living the Christian life. With information bombarding us from all sides— friends, teachers, internet, television, radio, books, newspapers, etc., we need to be able to not only see ‘with the eye,’ but through the eye, using the lens/spectacles of our Christian worldview, so we are not “tossed to and fro by every wind of doctrine.” As Nancy Pearcy observes, “Learning critical thinking is important not only for speaking to people outside the church but also for educating people on the inside. They often absorb ideas from the cultural atmosphere and thus need help liberating their minds from secular assumptions.” But thinking “critically” is not enough. As Christians we must seek to think biblically; that is, we must be “renewed in our minds” (Romans 12:2) by the Word of God (2 Timothy 3:16). Only then will we be able to test and approve what God’s will is for our lives (Romans 12:3). As Christians we recognize that all the treasures of true wisdom and knowledge are found in Jesus Christ (Colossians 2:3; cf. 1 Corinthians 1:18-2:16). It is through bringing “every thought captive to the obedience of Christ” (2 Corinthians 10:5) that we can avoid fine-sounding, but deceptive arguments (Colossians 2:3). After all, we are called to love God with all of our mind (Deuteronomy 6:5; Matthew 22:37). So, “see to it that no one takes you captive through hollow and deceptive philosophy, which depends on human tradition and the basic principles of this world rather than on Christ” (Colossians 2:8; emphasis added). As Christians, and especially those who have embraced the ministry of Christian apologetics, it is the truth that we are commissioned to bring people to believe and understand. 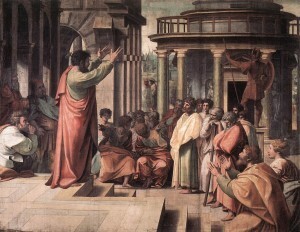 As Pilate asked Jesus, “what is truth?”, so it is asked by those that we meet in the course of our daily life. It is our calling to bring them to the ‘way, the truth and the life.’ (John 14:6) However, we will only be equipped to do so if we ourselves are thinking critically about the ideas, ideologies and philosophies that we as Christians encounter in the course of our lives. As Christians, we are to follow the example of the Christians at Berea. They were of “more noble character” because “they received the message with great eagerness and examined the Scriptures every day to see if what Paul said was true” (Acts 17:11).